The City of Penticton, BC, is the perfect sun, sand and surf destination. Following the high clay bluffs south along Highway 97 from Kelowna, you enter Penticton. With Okanagan Lake to the north and Skaha Lake to the south, this city is a leisure and recreation mecca. 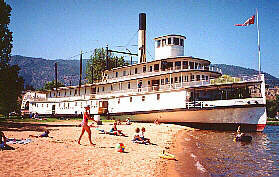 Choose from houseboating, sailing,windsurfing, waterskiing, power boating or a lazy float down the Okanagan River Channel. Get your gear and challenge yourself on the Skaha Bluffs - one of the best rock climbing pitches in the world. Drive off to one of the 250 fishing lakes within 30 minutes of Penticton city centre. Maybe a tour through one of the many nearby Okanagan wineries, sampling local orchard produce or browsing through the local craft shops, museum and galleries is more to your liking. Winter brings fun at Apex Mountain Resort, a nearby ski area with both alpine and nordic skiing, snowboarding, snow showing, ice fishing and sleigh rides. Lodging: Accommodations in Pentiction are many and varied. Charming Bed & Breakfasts, luxury resorts, destination hotels, value motels as well as fully equipped RV Parks and picturesque campgrounds give the visitor a wide range of lodging and vacation options to choose from. 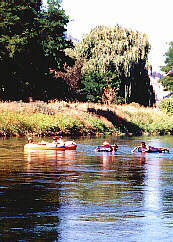 Okanagan Lake Provincial Park, north of Penticton, on the west side of the lake, offers over 150 campsites The sandy beaches and well manicured sites make it a popular oasis for RVers and campers in the summer season. 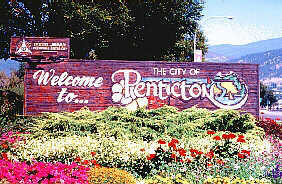 Access: Penticton is located in the beautiful Okanagan Valley 20 km (12 mi.) north of Okanagan Falls on Highway 97, 393 km (243.6 mi.) northeast of Vancouver, BC and 356 km (220 mi.) north of Spokane WA. The area is also serviced by national and regional airlines as well as bus lines. Recreation Facilities & Activities: ski areas, golf courses, helicopter sightseeing tours, houseboating, sailing, windsurfing, waterskiing, swimming, rock climbing, fishing, camping, hiking, biking, sightseeing, Ironman Triathalon, Okanagan Hockey School. 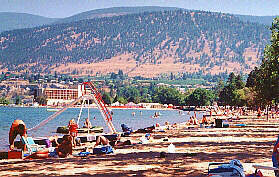 Okanagan Lake's Kickininee Provincial Park, off Hwy 97 about 14 km north of Penticton, offers vacationers a selection of public beaches: Pyramid, Kickininee, and Soorimpt Take. The 30 ha. Sun-Oka Beach Provincial Park, located north of Penticton on Hwy 97, just before Summerland, boats superb beaches and 190 day-use picnic sites.